Yes folks, that is a glorified pair of high heels and yes that IS a jolly great big spring you are seeing under the heel. Just above it is a "rigid orthotic foundation that supports and protects your entire midfoot." which prevents "... over-stretching of the plantar ligaments across the base of the foot" ... which in turn helps prevent "painful heel spurs and plantar fasciitis". Erm, isn't the stretching part what feet are meant to do? 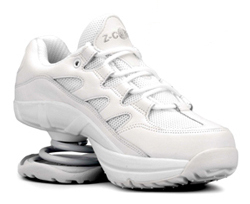 Z-CoiL footwear is engineered specifically to relieve foot, leg and back pain. ... and puts more cash in our pockets. From what I can tell, these shoes "protect" you by encompassing your feet in rigid blocks that don't move and adjust as your feet really should and then provides a spring to compensate for the lack of natural shock absorption and propulsion your feet naturally provide. Oh and they come in a wide range of fashionable designs too. Please please please people, don't waste your money on these other than to maybe keep them in a glass cabinet along with your other bizarre collectors items. I can't help but feel these will cause more damage in the long run than good.